Marinate the prawns with ginger – garlic paste & ¼ tsp. light soya sauce for 20 mins. In a large wok heat vegetable oil till hot. Add the prawns & stir-fry till the prawns are just cooked & keep aside. To the same wok add carrots, cabbage & shallots (reserving few for garnishing), a pinch of sugar & stir-fry briefly. Now add light soya sauce, dark soya sauce, rice vinegar & keep tossing on high heat. Reduce the heat to med. if desired. Finally add the fried prawns; mix & toss from time to time. · You can add a mix of vegetables of your choice. · Add eggs if desired. Use plain scrambled eggs or make a plain omelette & cut into shreds & add along with the prawns. · Use prawns whole or chopped in pieces. · You can use a little cornflour in the marination if desired. · It is extremely important that you don’t overcook rice; grains must be separate after cooking . The grains should be cooked but must have a bite. · In case the rice has too much starch then pass quickly through running water. 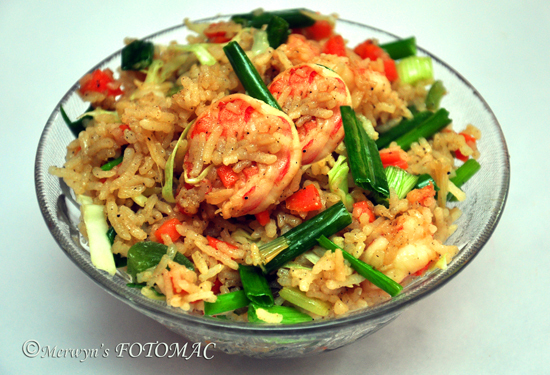 · Cool rice helps to retain the whole grain while stir-frying. · The wok must be really hot for stir-frying & tossing. · Avoid prodding the rice with a spoon; try & toss the rice to retain the grain. · If you do not have a large wok, prepare it in smaller batches.